Wie cool ist das denn? London. This year’s EAG in London has marked a milestone for GeWeTe. Its largest stand to date at this British amusement show reflects GeWeTe’s position in the UK market. “The UK is our most successful international market. We have been active in the UK for 20 years now”, explained Mr. Aristidis Tsikouras, Managing Director of GeWeTe. “We expanded our stand yet again so that we can show our complete solutions for the UK market. The feedback was excellent over all three days of the show”. The UK team keeps on expanding. Headed up by Mark Edmundson, the EAG was the first GeWeTe show for new sales colleague Mike Finnegan. “We are looking to grow our team here further”, explained Mr. Edmundson. “We provide local service, maintenance and on-site support. This is very much appreciated by our customers”. The UK amusement market is very diverse and thus the requirement for money changing and money management varies strongly. There is no one set solution. GeWeTe has an extremely wide product range so that it can provide the optimal solution for each market segment, whether CITO, TITO, bingo, Adult Gaming Centres (AGCs), Family Entertainment Centres (FECs), sports betting or casino. At this year’s EAG the buzzword centred around contactless payment. Having researched the market to understand the new requirements, GeWeTe presented its solution here – the Cash-Recycler that includes payment methods by cash and contactless. Its high change capacity alongside its focus on security, quality, reliability and service made this the centre of attention of the GeWeTe stand. The pub market has been underdeveloped for change requirements and nowadays landlords often wish to have a separate change device. The Cash-Center-Compact with 7” touchscreen was introduced to the UK market at this year’s EAG. 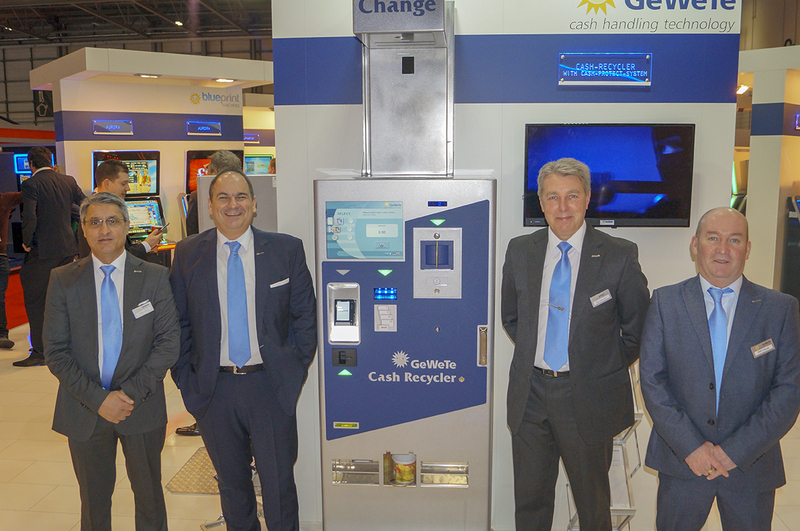 It offers extensive coin and banknote change capacity and was greeted as the perfect solution for pubs at the EAG as it even offers banknote recycling. Chip N Pin and TITO/CITO are also included and this solution will be ready for delivery to UK operators in this first quarter of 2018. “We are constantly listening to our customers to ascertain their needs. We have the capabilities to quickly develop unique solutions for the market with our well-known and respected GeWeTe quality and favourable prices”, concluded Mr. Tsikouras.